Do your Staff and Students know how to use Crime Stoppers to benefit your school? Windsor and Essex County Crime Stoppers Police Coordinators Constable Amanda Allen and Constable Kristina Gilboe would like to be guest speakers in YOUR classroom or assembly. Our program provides an anonymous reporting option about unsolved crime or crime about to be committed. We process information for the Amherstburg, LaSalle, Tecumseh, Lakeshore, Essex, Kingsville, Leamington and Windsor area. What we teach: We talk about our program and how Crime Stoppers works in our community and specifically your school. We also offer volunteering opportunities to get involved with our organization. Time permitting, we will also share some of our policing experiences. Benefits: Many students have heard about Crime Stoppers but don’t know how it works. At the end of the session students are left with the knowledge, power and ability to help their community. As a bonus, we bring small tokens of appreciation as a reminder of our presentation. Presenters: Constable Amanda Allen is an OPP officer with 29 years’ of experience and Constable Kristina Gilboe has been a Windsor Police officer for 16 years. Social Media: You and your students are encouraged to research us on Facebook, Twitter (@cstoppers) or Instagram (Catchcrooks) to stay informed with what crime and events are taking place in around your school or neighbourhood. How to book: Simply visit www.catchcrooks.com/school-group-presentations and we will book a time that is works for you. Every Wednesday night is September, come out to Riverside Sportsman Club for Charity Pasta nights! For only $8, you get all you can eat Pasta, Salad and Buns! And a portion of the proceeds go to supporting Crime Stoppers programing. Windsor & Essex County Crime Stoppers has recently distributed drug awareness posters, titled “Find the Fentanyl” throughout our community. These posters have been created specifically to highlight the dangers of Fentanyl and other opioids. In an effort to assist our police partners reduce the illegal use and trafficking of Fentanyl in our communities, Windsor and Essex County Crime Stoppers is again implementing a drug reduction strategy. The Windsor and Essex County Crime Stoppers board of directors are concerned about the accessibility of this drug in our community and how dangerous it is. The Board of Directors has authorized a $1000 Guaranteed Reward Campaign for July and August 2018. “Last year our campaign targeting Fentanyl proved to be successful and demonstrates the effectiveness of this anonymous reporting service,” advised Constable Kristina Gilboe, Windsor Police Service Coordinator for Crime Stoppers. The initiative will pay $1000 rewards for tips that lead to the arrest of an individual(s) responsible for trafficking Fentanyl in our community. The initiative will take place from now until August 31st, 2018. Anyone who has information on persons trafficking Fentanyl in Windsor and Essex County and wish to remain anonymous are asked to contact Crime Stoppers at 519-258-8477, or submit a tip online at www.catchcrooks.com. Contents Processing Centre (CPC) of Windsor, Ontario, provides professional contents restoration, contents recovery, and ultrasonic cleaning of personal and business items that have fire damage, flood damage, smoke damage or unpleasant odours. They have factory-trained and certified Precision Cleaning Specialists who know how to maximize the rate of recovery for items that have suffered damage from fire, smoke, water and odours. They are also a depot that recycles electronics, working or not, to ensure they do not end up in the landfill. During the month of July, you can drop off unwanted electronics to CPC for them to be recycled, proceeds from the drop offs will be donated to Crime Stoppers. Drop offs at CPC can be made Monday to Friday between 8am and 4pm. The announcement of the selection came during the AGM of the Ontario Assosiation of Crime Stoppers, held on June 1st in Hamilton. 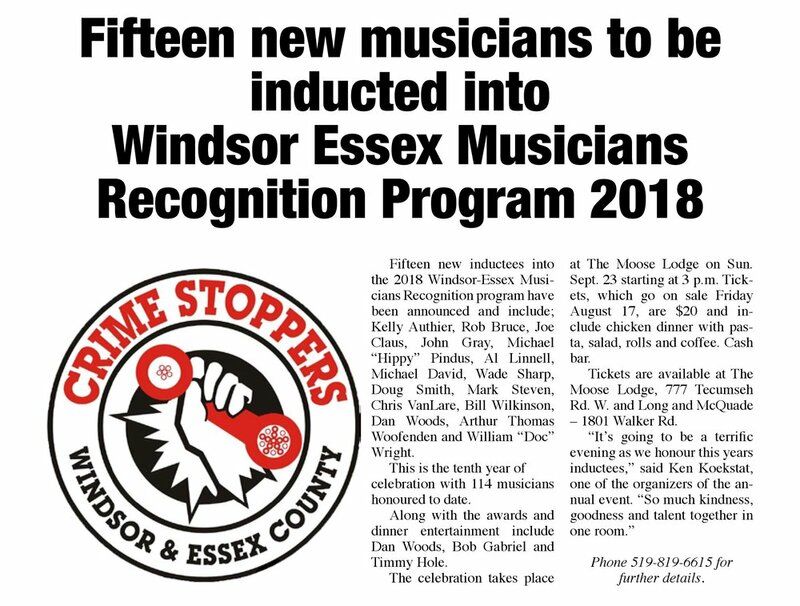 Windsor & Essex County Crime Stoppers welcomes the 38 Crime Stoppers programs from around Ontario to explore, visit and enjoy the amazing sights and sounds our region has to offer next May 30th to June 2nd. Well, I will say that I am still not fully recovered from the amazing Bail or Jail 2018. It was fast, furious and fun! We are super excited to say that this year, by the generosity of our community, we hosted our best event in over 5 years! Thanks to our 19 arrestees, we were able to raised more than $22,000 towards Crime Stoppers programming. I would like to give a huge Thanks to Dianne as committee chair. Dianne spent countless hours working towards this event. Thanks to the committee as well. Many little details and the day of the event would not have gone as smoothly without your help. Thank you Lina, Ernie, Kris and Glen! We are already hard at work planning next year to make it bigger and better than ever! Board Member Lina is Going to Jail! Help bail her out here! Crime Stoppers Annual Event, Bail or Jail is just under 2 weeks away! Celebrating over 30 years, this event has evolved from a simple Telethon Style event, to live video trials, to the social media hosted style event that it is today. Every Dollar Crime Stoppers raises goes towards the reduction of crime, public awareness of the program, and education of crime preventions in our local community. We raise 100% of our funds through events like this, as we receive no government support. The Bail or Jail event raises funds through donations by arresting your friends, family, neighbours, employers, or pretty much anyone you know. They are convicted of an offence and thrown in jail where they need to raise money to “Bail them Out”, but some people would rather pledge to “Keep’em in Jail”! We try to keep this event as entertaining as possible for our ‘Arrestees’ and for you. So we ask you to join us at Tecumseh Mall, May 10th. Please check out http://bailjail.catchcrooks.com/ for full details! Nature surround the runners on all sides as the scenery encouraged them to explore along the running path. This race was half road, half packed trail through the woods.